Pharmacology remains the mainstay of treatment for hypertension across the globe. In what may seem like a well-trodden field, there are actually an exciting array of new pathways for the treatment of hypertension on the horizon. This review seeks to discuss the most recent research in ongoing areas of drug development in the field of hypertension. Novel areas of research in the field of hypertension pharmacology include central nervous system regulators, peripheral noradrenergic inhibitors, gastrointestinal sodium modulators, and a counter-regulatory arm of the renin-angiotensin-aldosterone system. This review discusses these pathways in a look into the current status of emerging pharmacological therapies for hypertension. Arnold AC (2018) Blood pressure lowering effects of angiotensin-(1–7) in primary autonomic failure. https://www.clinicaltrials.gov/ct2/show/NCT02591173?term=NCT02591173&rank=1. NCT02591173. Accessed 24 Feb 2018. 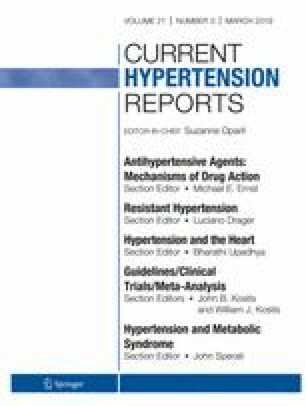 Biaggioni I (2018) Cardiovascular effects of angiotensin (1–7) in essential hypertension. ClinicalTrials.gov. NCT02245230. Accessed 24 Feb 2019. Lange C, Sommerfeld M, Namsolleck P, Kintscher U, Unger T, Kaschina E. AT2R (angiotensin AT2 receptor) agonist, compound 21, prevents abdominal aortic aneurysm progression in the rat. Hypertension. 2018. https://doi.org/10.1161/HYPERTENSIONAHA.118.11168. Bial-Portela, C S.A. Safety, tolerability, pharmacokinetics and pharmacodynamics of BIA 5-1058. In: ClinicalTrials.gov. 2018. https://clinicaltrials.gov/ct2/show/NCT03708146. Accessed 24 Feb 2019. SA QG. Phase IIa study of the product QGC001 compared with placebo in patients with essential hypertension (2QG1). ClinicalTrials.gov. 2016. Accessed 24 Feb 2019.